This article is about the 30th century version of 20th Century Fox. For other uses, see Fox. For the episode, see 31st Century Fox. 30th Century Fox is a future version of 20th Century Fox, whose spotlights are used to blind pilots and film the resulting crashes. [3ACV08] In the 31st century, it produces TV programs such as Futurella, which it cancelled in 3010. 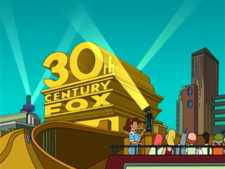 [6ACV11] The company first appeared in the real world as an aesthetic change to 20th Century Fox's logo exclusively in the end credits of each episode of Futurama. The production logo appearing at the end of early episodes. A spoof of the original 20th Century Fox logo. The widescreen production logo, appearing at the end of every film and some newer episodes. A view of how the spotlights are used to blind pilots. Futurama was the first show on Fox allowed to change the production logo at the end of every episode. Originally, Fox denied this request, and Matt Groening funded the new logo himself. After Fox saw it, they decided to allow it and reimbursed him. This list does not deal with appearances of the 30th Century Fox live-action logo, as this appears at the end of the credits of every episode and film.